Trouble on the Tracks: Are Stricter Standards Needed to Stem the Tide of Recent Derailments? 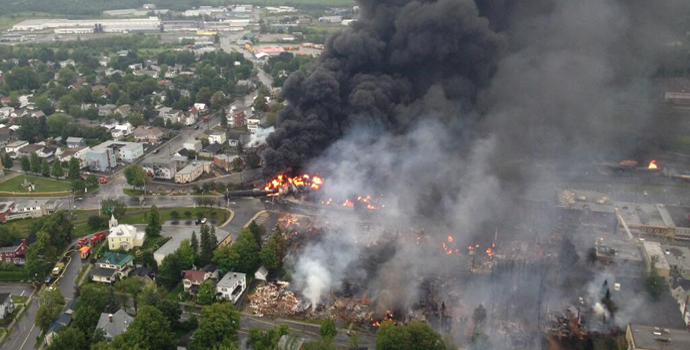 The Lac-Mégantic rail disaster in July 2013 was the deadliest train accident in Canada since 1864. The devastation caused by the explosion of several tank cars prompted the Canadian government to mandate the phasing out or retrofitting of the older DOT-111 tank cars. Several recent high-profile train explosions showed signs that revised safety standards for tanker car construction voluntarily adopted by railcar manufacturers back in October of 2011 may be failing to prevent the oil fueled infernos that caused these trains to fall off the tracks. The newer voluntary industry standard, called CPC-1232, was meant to phase out its significantly older cousin the DOT-111. With shale oil booming in North Dakota and Montana, rail shipments of oil and ethanol to refineries on the coast jumped from 9,500 carloads in 2008 to as much as 500,000 carloads today. This kind of large scale shipment encouraged industry leaders to revise their methods of shipping to ensure the safest possible transportation across land. Instead, the increase in wrecks has transport officials wondering why the CPC-1232s don’t seem to be enough to prevent these incidents. “This accident is another reminder of the need to improve the safety of transporting hazardous materials by rail,” Christopher Hart, acting Chairman of the U.S. National Transportation Safety Board, said in response to February’s West Virginia derailment. The CPC-1232 cars feature thicker shells for non-jacketed tank cars, better top fitting protection, reclosing pressure relief devices, and half-height shields on either end of the car. All of this should theoretically combine to create a safer, less explosive vehicle. However, these trains are still exploding, leaving industry officials struggling to determine and solve the true cause of derailment. Industry experts are trying to sort out the cause(s) behind the recent spate of derailments, including a particularly devastating derailment in Virginia in 2014 and the February 2015 crash depicted here. One theory that has been presented by several analysts is that the problem may not lie with the standards of the new cars, but with the voluntary nature of the standards themselves. Because manufacturers are not required to immediately adopt the new car standards, more than 75,000 “legacy“ cars that don’t meet CPC-1232 standards are still in use. It may be that sparks ignite the oil leaking from these old cars, triggering massive explosions that derail the train and cause catastrophic damage. There’s another issue at play that could also factor into these explosions: North Dakota’s crude oil is much more volatile than traditional, heavier oil. It’s more like gasoline, rich with fuels like methane, ethane, propane and butane. These liquids separate from the oil and expand into gas, forming an extremely volatile propane-butane pocket above the oil. 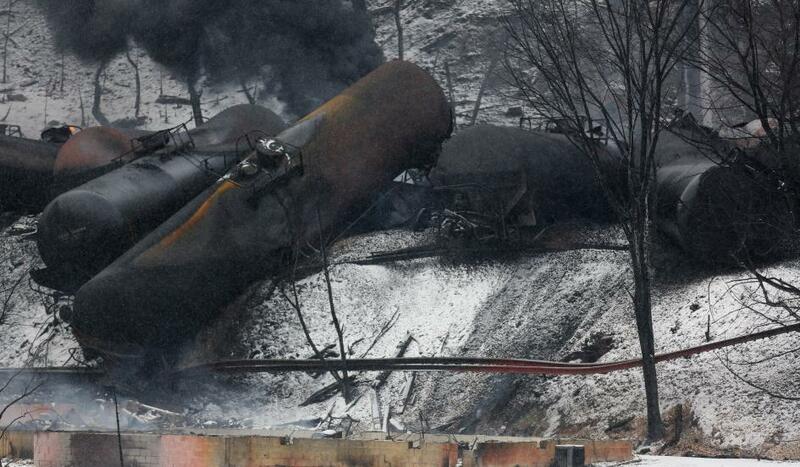 If a railcar ruptures, the gas combines with oxygen. Then any spark will ignite the fuel and the car will explode, unleashing heat and fire onto the cars around it. Thus, the longer the train, the more opportunity for devastation. Coupled with older cars that were never designed to carry such volatile crude oil, the resultant explosion would be challenging for even the thick shielding of the CPC-1232 cars. Despite some lingering uncertainty surrounding the accidents, officials are considering adopting newer, more stringent, federally mandated standards for developing even more secure tankers. Join us next week as we take a look at the process used to create the CPC-1232 cars, the differences between the DOT-111 tankers and the newer CPC-1232, and whether or not the CPC-1232 may have contributed to the recent wave of accidents. Until then, we invite you to share your thoughts in the comments below. The derailment of cars do to the volitile fuel leaks interesting. I knew there was a huge boom in oil in North Dakota regarding production. The difference between ten thousand and five hundred thousand is staggering. The west Virginia derailment was mentioned I do not see that derailment directly connected to North Dakota transportation. The story was interesting. The idea that the integrity of the cars is to be tested is smart cover al the basis that can lead to a wreck.